Vata is the element of coldness, causing cold hands and feet when imbalanced. It is also quick, representing the element of movement, thus you can become restless and scattered, endlessly talking and moving, making it difficult to stay focused. Light by nature, vata can translate to light sleep, or a tendency for insomnia as your nervous system cannot settle down. Vata is rough and dry, so you may notice rough and dry hair, skin, and nails. Vata tends to emaciate the body’s tissues, causing osteoporosis, weight loss, or thinning hair. Imbalanced vata moves thoughts quickly through the mind, so you can absorb information quickly and then forget it quickly. Because your physiology is running fast you can become fatigued as the body cannot keep up with the fast-moving pace you force your it to undergo every day. Are you noticing yet that many of these symptoms are also characteristics of thyroid imbalance? 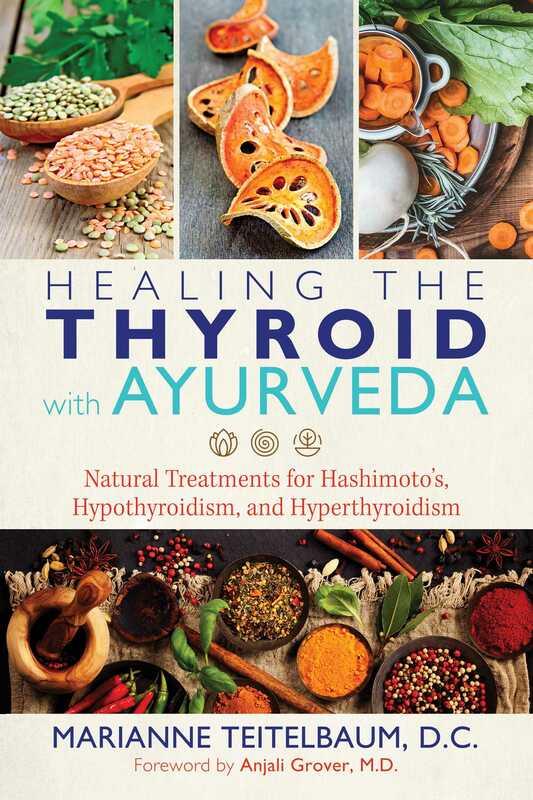 Throughout the thirty years of my practice, I have noticed hundreds of instances of vata types contributing to their thyroid problems by weakening their endocrine systems through incessant talking and boundless activity--which are on full display when they visit my office. This is a recipe for adrenal burnout and is the first step toward thyroid weakness. The endocrine glands cannot handle this amount of intense activity. The adrenals and thyroid glands are the batteries we run on. They can become depleted and in need of a recharge, accomplished through proper rest, nourishing diet, and early bedtime. In the early stages, vata aggravation and hyperactivity can push the thyroid gland into a hyperthyroid (or overactive) state. But over time the gland will fatigue and become hypothyroid (or underactive) and unable to produce enough hormones. Vata aggravation can weaken not only the thyroid gland and the whole endocrine system but also the seven dhatus (the seven tissues in the body according to Ayurveda: blood plasma, blood, muscle, fat, bone, bone marrow, and reproductive fluids). If you can fully understand what vata is and how imbalancing it can affect your thyroid gland, then any treatments you undertake will work more effectively if, at the same time, you learn to balance the disturbed vata.